My problem with the study is that I don't think the questions asked are adequate to designate someone as racist or anti-immigrant. You should devise a better tool, then, get the results and publish them. So? What does that have to do with the price of tea in China? Three million more Americans still voted for Hillary over Trump. More Americans voted for Democratic Senators and more Americans voted for Democratic Congress-persons. 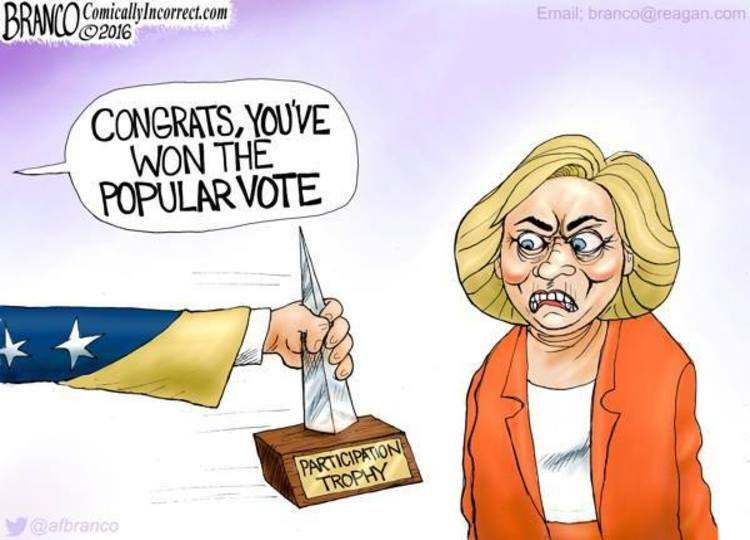 Democrats won the popular vote for President in 6 out of the last 7 elections. That's like saying that your team got more field goals. Last edited by Agatha; 20th October 2018 at 09:57 AM. Patriots got more yardage in Super Bowl 52 than the Eagles. Guess that means the Patriots are the real winners. The Trump voters whom I've seen turn away from him have largely done so because of his character flaws. So let's highlight those. Put them in opposition to the vaunted American/Christian values. Won't work. This isn't a popularity contest. Voters don't ask themselves, "which candidate is the most 'not racist'?" They ask themselves "what can this candidate do for me?" "New Study Confirm Kafirs Elected Trump"
"New Study Confirm Potential Trouble Sources Elected Trump"
"New Study Confirm Satanists Elected Trump"
Basically the story we're being told is that the people who were okay with the Black President but no with the old money Southern white lady... were racist. The Clintons are not old money. Hillary Clinton is not Southern. You may want to rethink your analysis. That said, this study doesn't bode well for Elizabeth Warren's chances. On the other hand, maybe she could win both the Native American and Racist American votes by renouncing her claim to Cherokee ancestry. I have no doubt that racism played a role in the last Presidential election. I also have no doubt it has played a role in the last 35 elections, although some more than others. The Southern Strategy exploiting racial divisions was a core component to Democratic victories in the South from the late 1800s to the 1950s and has been essential to Republican victories ever since. LBJ fretted over this when he signed the 1964 Civil Rights Act. He said he buried the Democratic Party in the South for a generation. And he was right. The poorest states can be counted on to vote against their own interests because of racism. I hate calling anyone a racist because the word is derogatory and is too all encompassing. No one proudly says 'I'm a racist!' Not even White Supremacists. But that doesn't mean that racial attitudes and xenophobia aren't real. A very great many people have negative attitudes about other races and often without even being aware of it. This study tells us what we already knew. That Trump exploited racial resentment to become President. This doesn't mean that Democratic candidates should employ a strategy of calling Trump supporters racists. And I don't actually know any that are. I think the study is important as a tool to understand racial attitudes and nothing more. I don't know that that's true. A candidate's character is often more important than his policies. Just ask Hillary. Agreed. Hillary lost more because don't like her than people don't agree with her. If your arbitrary point system mattered they would've played the game differently. That was the point. No it's not. Trump won enough votes in a few states to eek out victories that resulted in that turd becoming President. That's fine. But let's not pretend that it equates to popular support. This is why I tell Democrats to relax. Trump's base and a few swing votes in very specific States allowed Trump to win. I'm convinced that he has his base and little else. Swing voters want nothing to do with Trump. The base alone is not enough outside the Deep South in 2020. I wondered who he was referring to there. Old money southern lady? Hillary grew up blue-collar on the North / Northwest side of Chicago and Park Ridge, Illinois. So total yardage only matters in fantasy football, and total votes only matters in fantasy presidential elections. That was never the point. The point was for you and others to stop suggesting everyone hated Hillary and loved Trump when that isn't true. Chalk the confusion up to humans being absolutely horrible with words that have two definitions. Ah, but you didn't understand what I had to say about that. So you actually have no clue what I am or am not suggesting. Yes... we get it... by the rules that were in place, the republicans won the elections. The problem is , from a moral perspective, the republicans should recognize that the majority of people in the country do not support them, and should govern accordingly (e.g. show willingness to make compromises with those from the opposing party, put forward less extreme policies, etc.) But the republicans have not done so. Despite losing the popular vote for the presidency (and congress-critters), the republicans have been ruling with an iron fist, cramming through legislation and political appointments that the majority of the country would likely not approve of. Long term, near absolute control by a party elected by a minority is not good for the country, as a population that feels "their opinions don't matter" often gets rather unruly. This is an invitation to open conflict. True, but it does show that if the electoral college didn't exist the Republicans would be *****. Not exactly a good analogy. It would be more like a Boxing match where more judges said X won, yet Y won because certain judges have a weighted vote. Also, it's nice to see that members receive the same talking points. Conservative news radio is my bet. This is why I hate "skeptics." You people are so proud of being so wrong. If popular vote mattered, the Trump team would've campaigned to get more popular votes. Making your idiotic point null and void. My question is, did we really need a study to tell us what more than half of Americans and the vast majority of the rest of the planet already know for a fact? I mean really... all you have to do is listen to his supporters. I have no clue what you're suggesting. I said that on an earlier post. River said Barney the Dinosaur could have beaten Hillary, but given that Hillary had 3 million more votes cast for her than Trump, this hardly seems true. Yet you said "not in 28 States." As if that changes anything. Unless your point is that Barney the Dinosaur did win in 2016. And if that is your point, I offer my apologies. Well clearly it doesn't to Republicans. They don't care that majority of Americans are for better health care either. Last edited by acbytesla; 18th October 2018 at 02:14 PM. And the way they would have to campaign to get more popular votes would be to take on the policies that appeal to more people that just the racists, super rich and feeble minded. Which is exactly what I said they should do, instead of appealing to extremists and hoping for a lucky break thanks to gerrymandering, voter supression, and the foibles of the electoral college. Again, the study isn't talking about racist republicans in general... it is concentrating on a subset of Trump supporters who had voted for Obama. Some argue that these people (Obama->Trump voters) aren't racist, that they just were worried about the economy and that they shouldn't be lumped in with the rest of the republican racist rabble. This study just said no, they're pretty much all homogeneous. Archie: I called youse all in here to let you know that I yam voting for the colored fellow, Osama. Meathead: Obama. Really Arch? Have you finally come to your senses about all the racist nonsense you've said over the years? Archie (snidely): No, I haven't finally come to my senses. (More seriously) It's just that McCain was held prisoner by the North Vietnamese. Who knows what commie propaganda they brainwashed him with? Meathead: Arch, you're voting for Obama again? That's wonderful! Archie: Yeah, that Romney fellow is a member of a cult where the men marry multiple women. Meathead: But Romney was the only Republican running who hasn't... oh, never mind! Meathead: I can't believe you're voting for Trump over Hillary. Why? Archie: She worked for that colored guy from Kenya. I nomed this. Now I can't say I never agree with you. Hey, wait- any body notice the study in the OP wasn't about WHITE racists? Did I miss the part about "white voters who..." ? Racism comes in all colors. I suspect the classical minorities are more racist than whites, in numbers, and just as rabid in range. But in an election so close that the popular count went the other way, andydamn identifiable group could be credited with the win/loss. It was the Alcoholics that pushed Trump over the top? The Dentists? Da Jews? You think black racists voted for Trump? A new study shows that people with conservative immigration attitudes voted for Trump. Wow. They really earned the grant money with that finding. Racism is a catch-all excuse from the left when things don't go their way. NO, Jews are not a separate race of humans. Judaism is just a belief system that has always been just a belief system. By the way, where's all that "evidence" of Trump being a racist (that I asked for over 100 posts ago)? There's just so much evidence that I was crazy to ask for any? Then just humor me and post some. Of course, there's also low-info voters, people who vote party line, and so forth - and every candidate gets those. Dolt 45 was brazenly bigoted, and bigots responded to that as well. Hmmm, but the same voters that voted for "Dolt 45" (oh and did I tell you how witty that is? Well it is just super, good job good effort) were the same ones who voted for... Barack Obama. Ohhh, bummer, good try tho mumbles. If we turn this into a popularity context both candidates and the country all lost. Uh, technically, yeah. If you count "Didn't Vote" as a candidate, then DV got 43% to Hillary and Trump's 27% each. 12% is not "close". Not saying that the US doesn't have an abysmal turnout. But 2016 was anomalous in terms of percentages. (An indication that the old "Republicans do well in low-turnout years rule of thumb.) The previous three GEs had turnouts over 60% and that compares favorably with those lah-di-dah snow humpers to the north. I love the fact that Trump enablers are so busy running interference for him and so steeped in their denialism that they completely ignore post 24 in this thread. I cited said member in my first post. There are numerous such citizens on FB and blogs and "awakened" websites. Obama woke the ugly dragon in many people. Just dealing with the day to day reality of one of "them" in the White House was enough to send them pining for their ancestral Jim Crow and Antebellum heritage. As to the strawman engineering team, let's get it clear, yet again. It was clear at the time of the election and is even clearer now. If you support (and by "support" we include 'pretend to not like him but still run interference for and enable his despicable policies') Trump at this juncture, you are either a racist or a racist enabler. I used to include different categories in the "enabler" sub-set to separate the whores who are willing to look the other way so long as they get whatever agenda item it is that they're after, but they're all "enablers" for purposes of this discussion which is on racism. Meathead: I can't believe you helped re-elect Trump. Why didn't you vote for Elizabeth Warren? Archie: The fake Indian? I got something in my trouser pocket she can Pow Wow Chow on! And this was predictable. And I was one of the (many) people who immediately predicted it. Your missing one very important point. Republicans have been deliberately trying to suppress the vote for decades They want not only to disenfranchise voters, they are trying to discourage voter participation. No ethnic group is a separate race. I'm not missing the point. I'm merely pointing it out. Suppression is one way of permanently assuring low voter turnout. But Republicans crave blizzards and storms on election day to add to it. The core GOP voter is more likely to have access to all-weather transportation and rural/exurban voters (their long suit) are also more likely to tolerate such inconveniences.